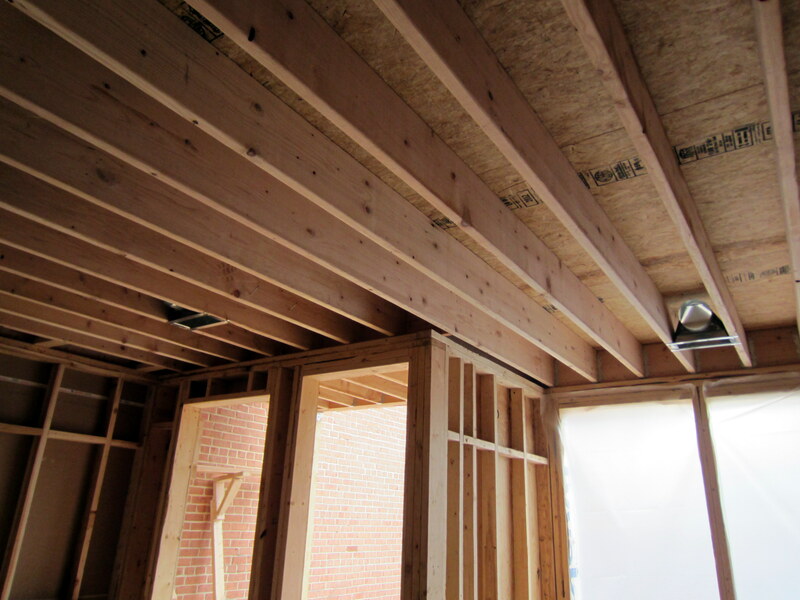 The interior framing is complete, so house infrastructure installation is on deck. The infrastructure components include mechanical, plumbing, hydronics, and electrical. 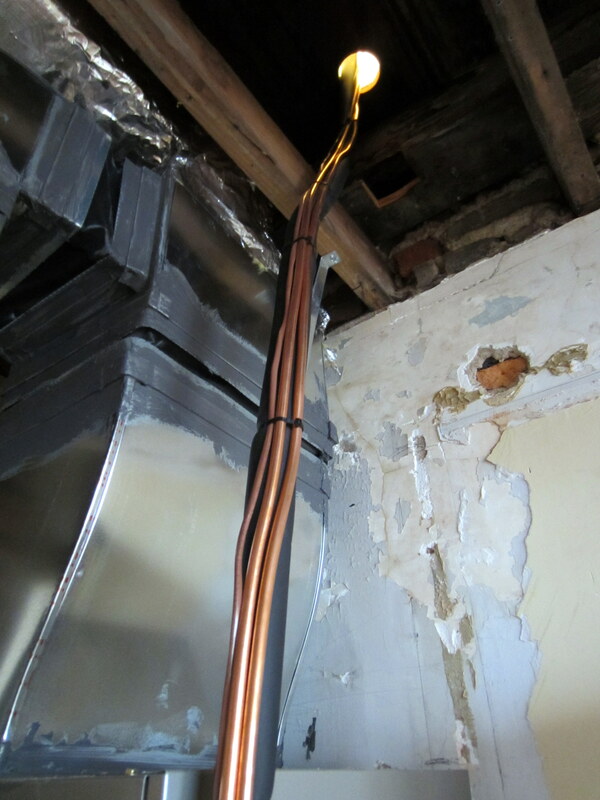 They get installed in that order, since the vents for the mechanical are the largest component, then the plumbing drain lines, then plumbing supply lines, then hydronics, then electrical cables. 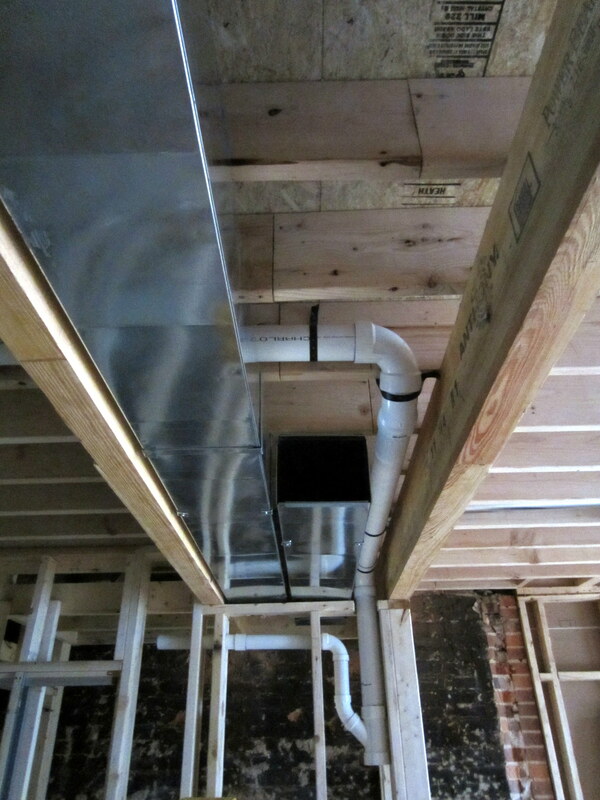 It’s a lot easier to route 3/4″ copper pipe around already-installed 10″ AC vents than trying to fit these vents in between framing and plumbing elements if they were done in the reverse order . . . The mechanical systems in newer houses typically includes an AC/heat pump that provides both cooling and heating through the same vents. Our house originally had radiators for heat (requiring a hydronic system to supply and return the hot water); separate AC vents and a mechanical system was added later to complement the radiant heat. 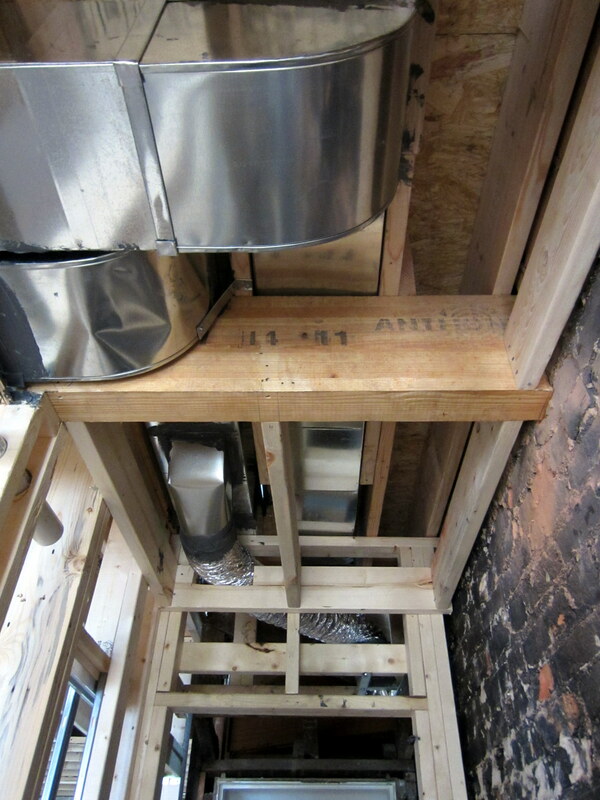 Once you have a house with radiant heat, you never want another system – trust us. So, we’re replacing and optimizing this system. 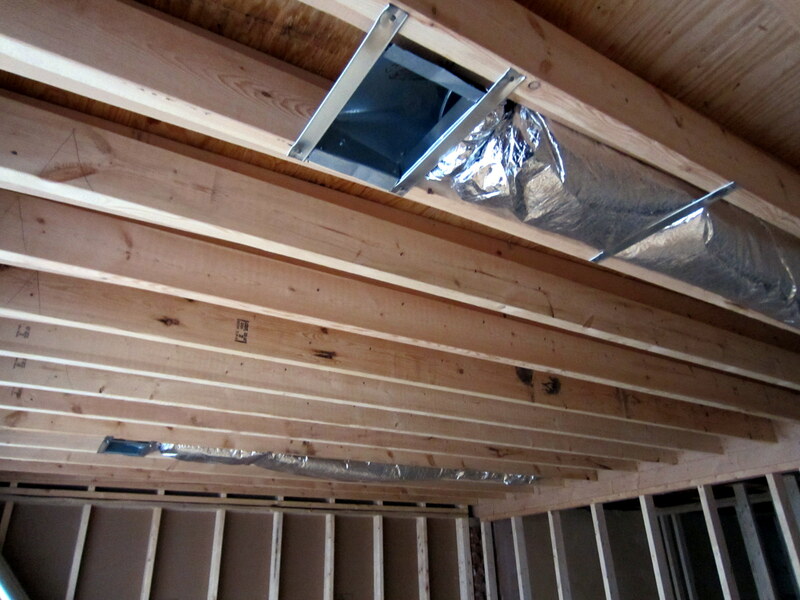 This post focuses on installation of the air handler and air conditioning vents. Future posts will cover the other infrastructure elements as they follow, in order of declining diameter. 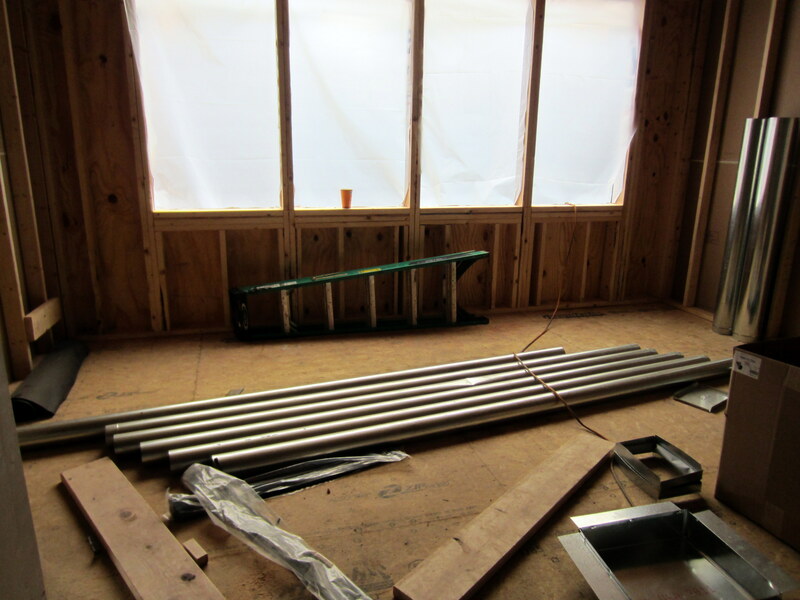 Vent components on the second floor ready for installation. The insulated units go above the rafters on the second floor, where the environment won’t be conditioned, like the interior spaces. 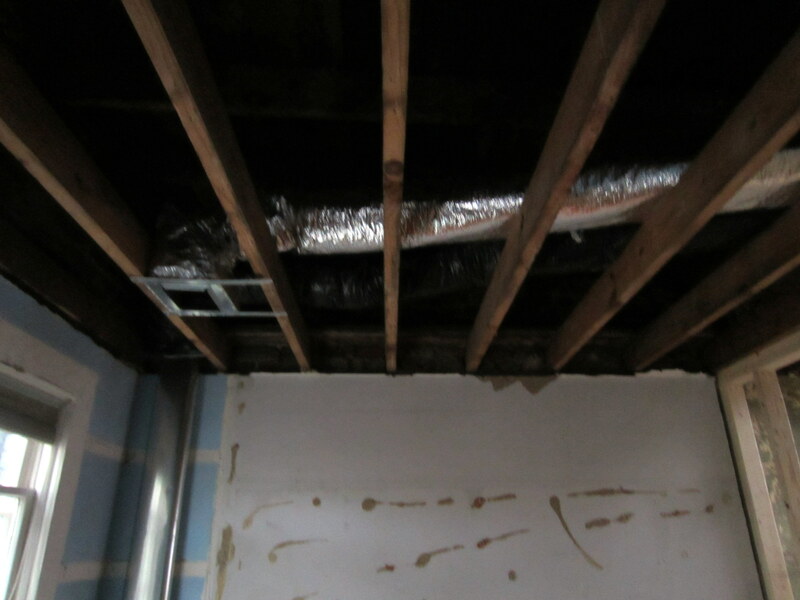 Although we’ll be doing foam insulation, which has a wicked bad R insulation factor, and a white membrane roof, the space above the rafters still will be hotter in the summer than the rest of the house. 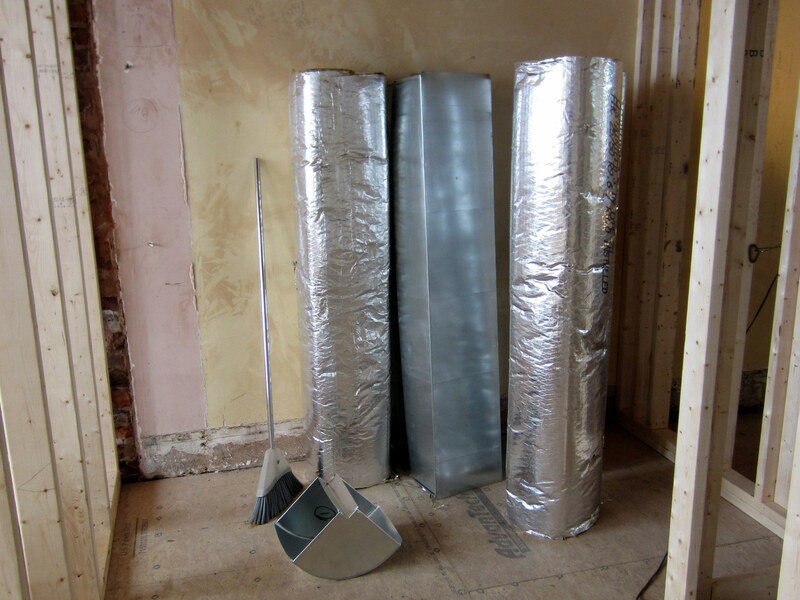 (Plus, code requires this, so, insulated vents it is.) 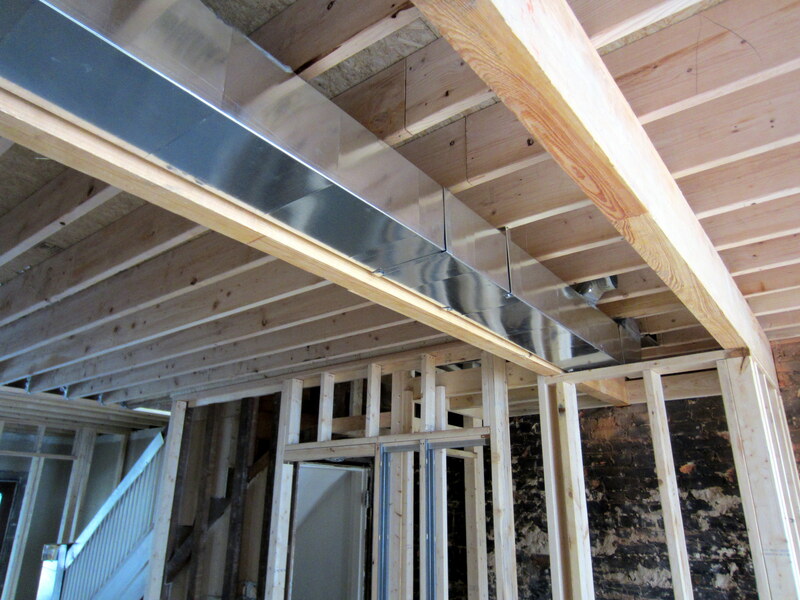 The bare metal vent will be installed between the second and first floors to supply the first floor with conditioned air in the summer. AC terminal units awaiting installation. These will branch off of the larger vent units shown above. 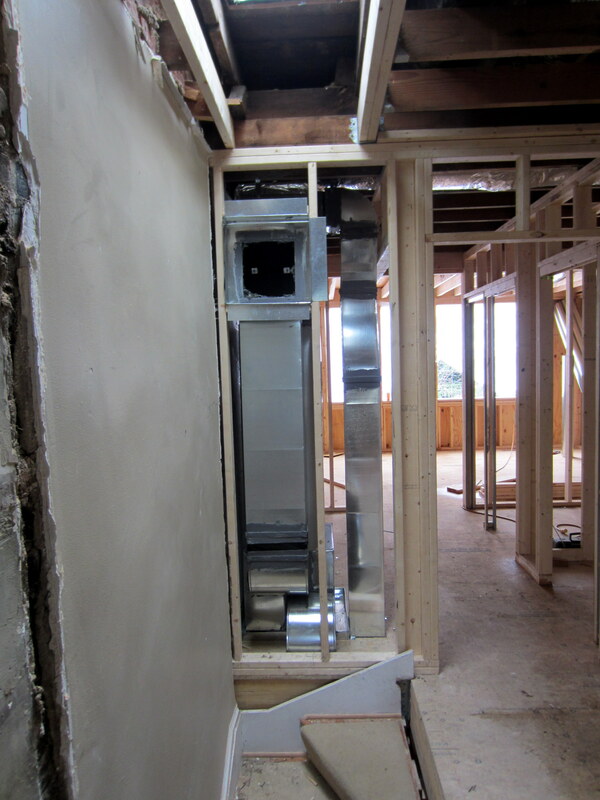 Insulated vents get installed in the master bedroom, awaiting registers during later stages of construction. 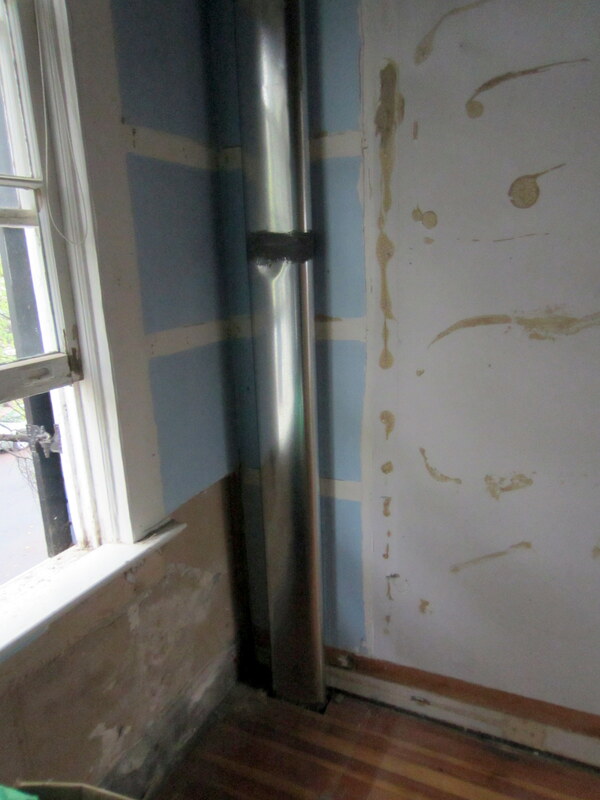 Venting in the master bedroom. This is routed directly from the air handler, so we’re hoping it won’t freeze us out in the summer . 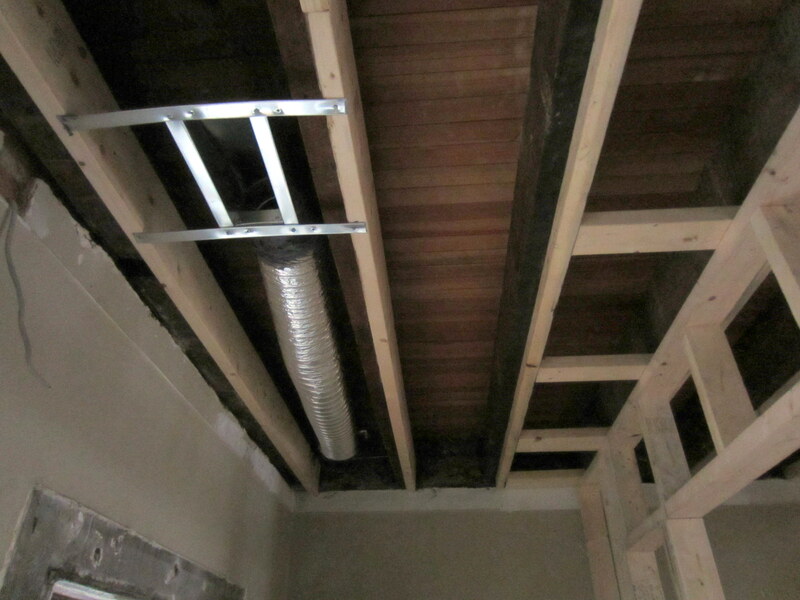 . .
Venting over the rafters in the guest room from the air handler to the south (right). 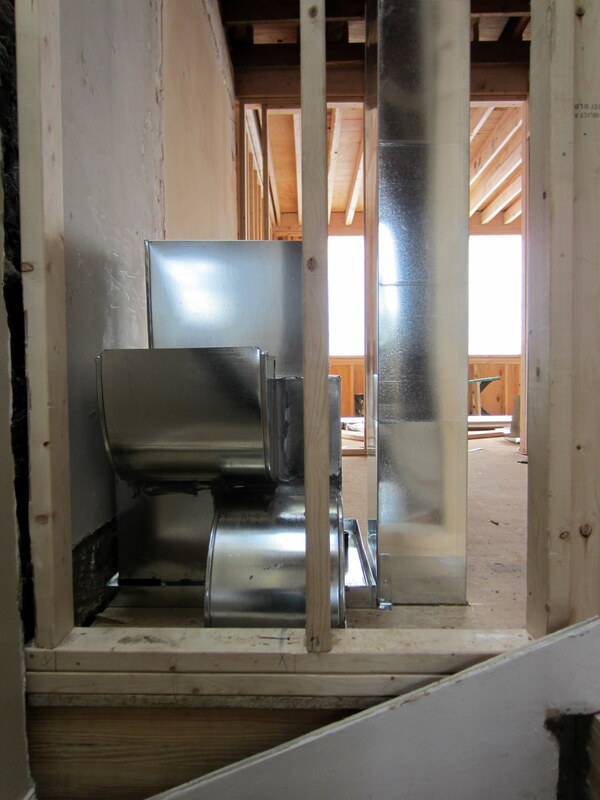 Although the vent in the foreground serves the guest room, there’s another behind with black insulation that leads to a ridgid vent pipe in the northeast corner of the room. The articulating, insulated vent at the back leads to a rigid vent which heads downstairs . . .
. . . to this articulated vent and opening for a register in the vestibule ceiling on the first floor. 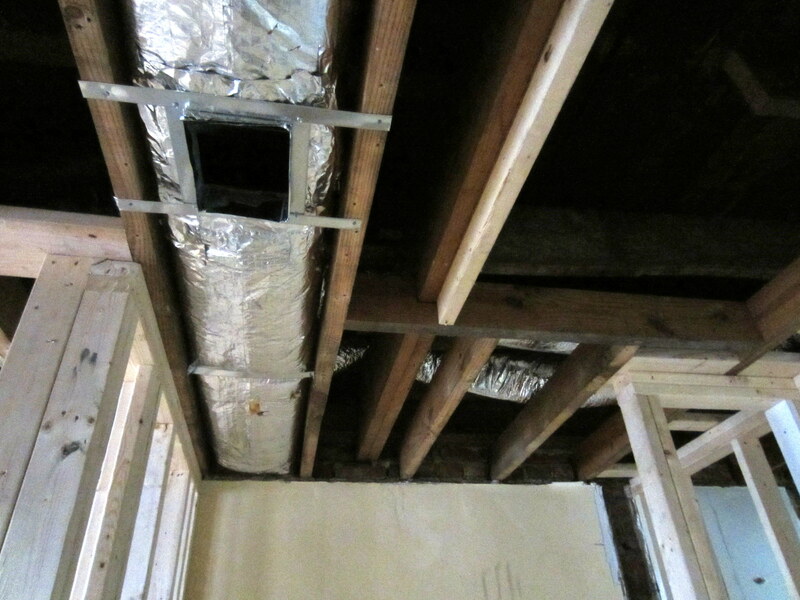 The reason for this routing is that, because we left intact the original, east-west oriented joists between the first and second floors at the front of the house, we can’t tie the AC in this area to the main supply line that you’ll see below. At this point, both the supply and return vents have been run through the bulkhead. The former will then branch out east and west through the bays between the joists to registers in the first-floor ceiling (ignore the drain lines, for now – we’ll deal with that bit of infrastructure in a future post). 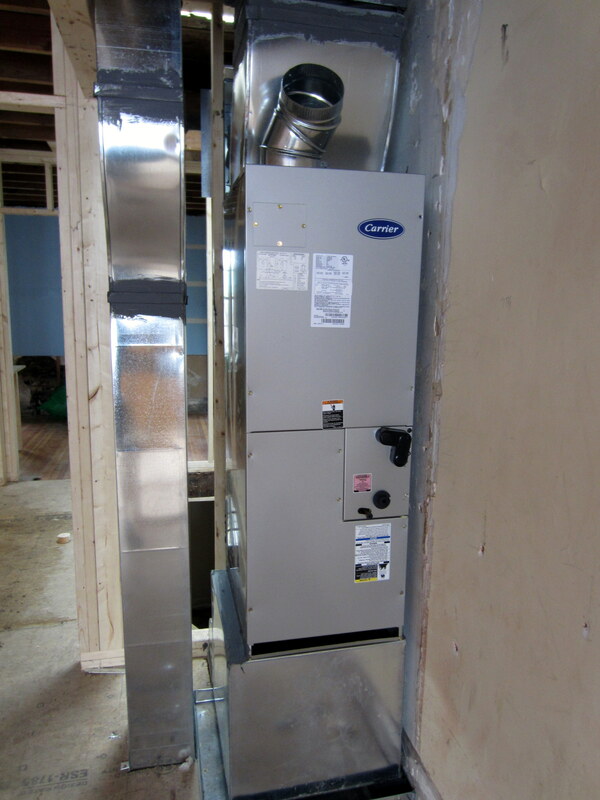 The air handler on the second floor after installation. One return register will be located here, at the top of the stairs (you can see the opening here). Another will be located near the dining peninsula on the first floor (stay tuned for the specifics – could be interesting). 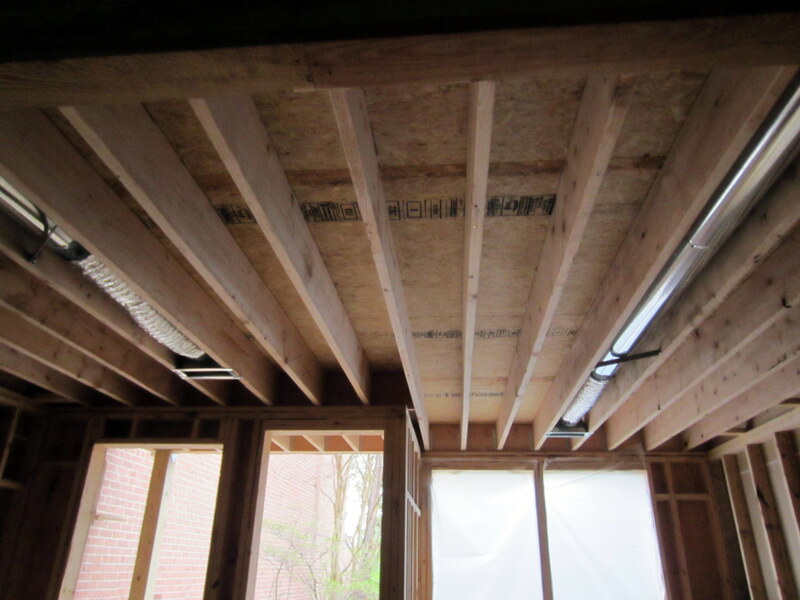 Love them glulam beams. The spell checker doesn’t recognize the word, but it’s legitimate – stands for glued laminated timber beams.